I just came back from a nice family camping trip to Wasaga Beach ! No internet, TV or even stamping!!! We had a great relaxing time! Now, to stay on the “beach” theme, I would like to share with you this card I made for my dad’s birthday. I used the beautiful stamp set “Wetlands“, combined with the “Faux Tear” technique. To achieve a “faux tear” look, you need a piece of scrap paper that you tear and use as a mask to sponge this “rough edge”. Here’s a great tip: Use the 2-Way glue pen to make your own “sticky note”. If you put some glue on the torn edge and let it dry first, it will still be sticky but you will be able to remove it after, just like a sticky note. So your torn paper will stay put as you sponge over it and it will make your life much easier!!! On my card, I used Crumb Cake, Baked Brown Sugar and Soft Suede for the sand and Pool Party, Coastal Cabana and Lost Lagoon for the sky. 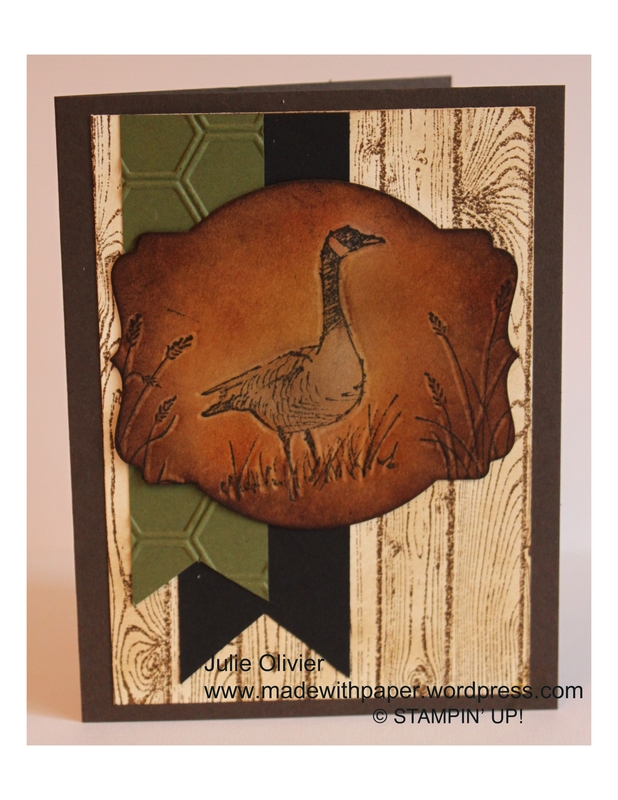 The goose was stamped on a different piece of Whisper White card stock and cut around. I colored it using the Stampin’ Markers Sahara Sand, Crumb Cake, Soft Suede and Basic Black. I used the White Signo gel pen to add some white on my little birds in the background. Watercolor Wonder Designer Note Cards make great cards in no time! Today’s project is made with the Watercolor Wonder Designer Note Cards and the Happy Watercolor stamp set. This card was put together literally in only minutes! 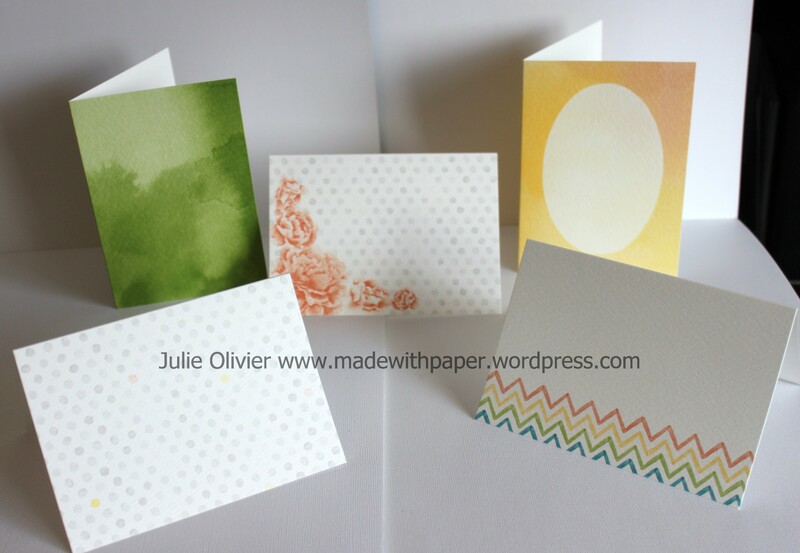 The Watercolor Wonder Designer Note Cards are printed cards on Watercolor paper. You have a perfect background pre-made for you! Simply stamp an image, add a greeting and voilà! These cards come in package of 20 and include 4 each of 5 designs. (Item #133362, $15.95) The envelopes are also included! This is a new item from the Occasion mini-catalogue. See it on p.22. 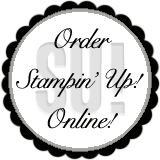 To order it, click here! Ink: Melon Mambo, Pink Pirouette, Gumball Green, Daffodil Delight Stampin’marker, Black StazOn ink. Tools: Blender pen, Large Oval punch, Modern Label punch, Dimensionals. 1. 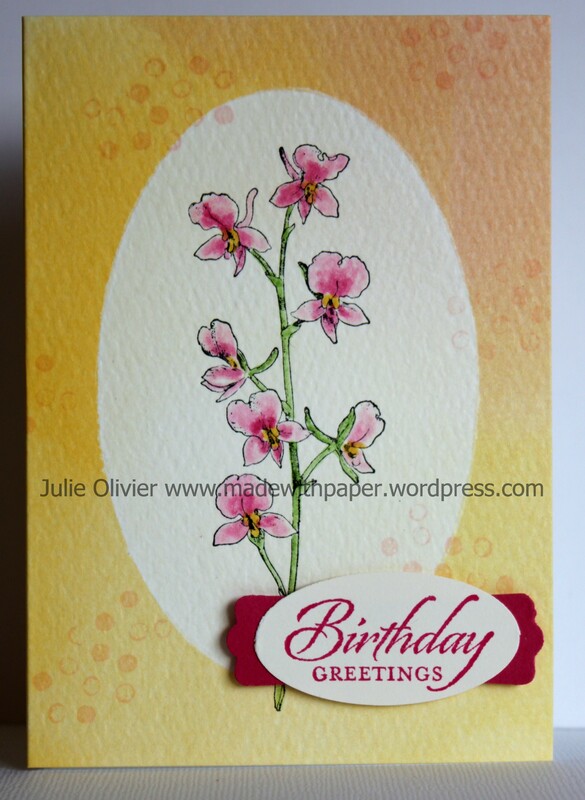 Take one printed Watercolor Wonder Designer Note Card and stamp the orchid flower (from Happy Watercolor stamp set) in StazOn black ink. Color the flowers centers with Daffodil Delight Marker. Then, with your blender pen color the rest of the flowers using the ink on the lid of your ink pad (Gumball Green and Melon Mambo). Tip: when working with the Blender pen, the color will be darker at the beginning and will fade out as you color. So start to color in the center of the flower and move you way to the outer edges. 3. Use the “little dots” stamp (from Happy Watercolor stamp set) and randomly stamp a few times on the background with Pink Pirouette ink. 2. 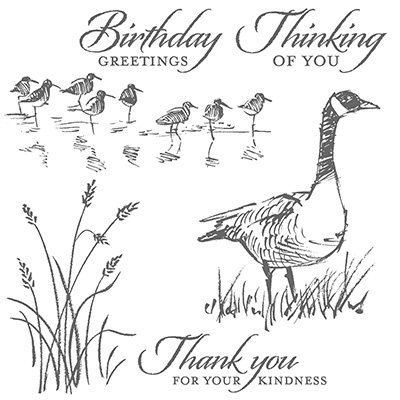 Stamp the Greeting with Melon Mambo ink on Very Vanilla card stock. Use the Large Oval punch to cut. Use the Modern Label punch to cut a label in Melon Mambo card stock. Adhere the Oval on top of the Melon Mambo label. Use dimensionals to adhere to the card. 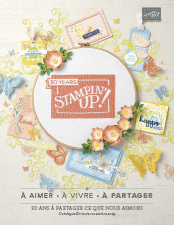 I told you I liked this stamp set! Wetlands is one of my favorite new stamp set! To make this card, I used the Apothecary Framelits as a mask and sponged the sky with Soft Sky, Daffodil Delight and Calypso Coral. For the water I sponged with Island Indigo. 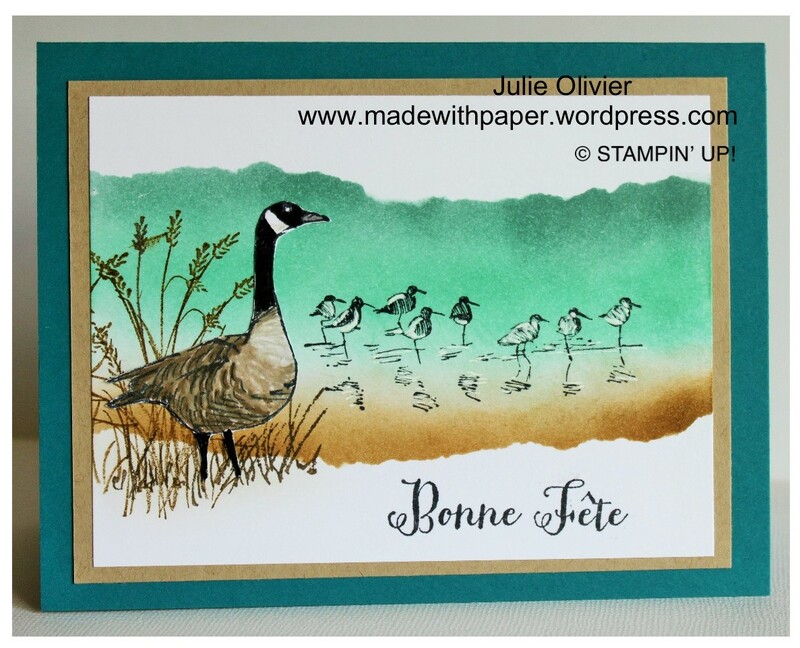 I stamped the goose with Black StazOn and colored it with the Markers. The wheat was stamped with the new In-Color Brown Sugar. The greeting was heat embossed with Black embossing powder. Ink: Brown Sugar, Soft Sky, Daffodil Delight, Calypso Coral, Island Indigo, Black StazOn, Versamark, Black Embossing powder. “Wetlands”: my new favorite stamp set! Have you notice this set in the new catalogue on p.69? 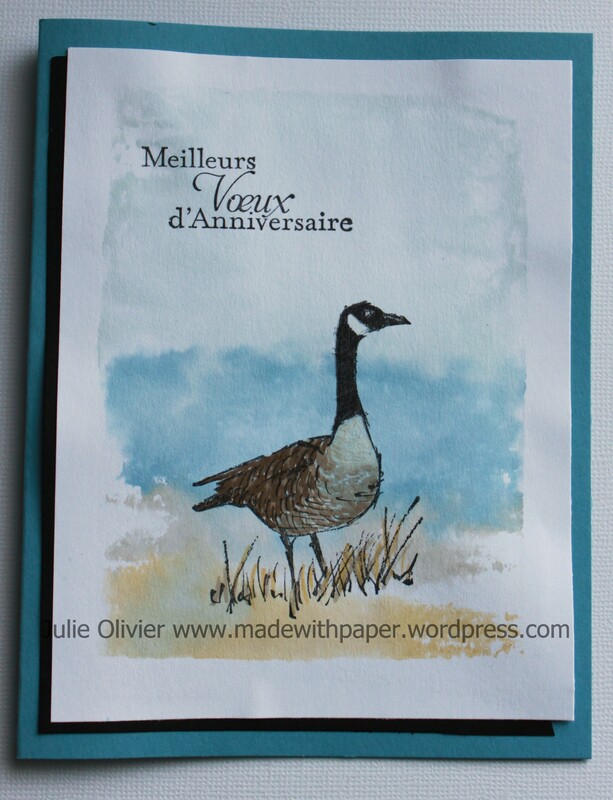 If you like birds and wild goose like me, you’ll fall in love with that set! But what’s even better is that it also has 3 beautiful (and very useful) greetings and it’s only $20.95 for the clear stamps!!! What a great value! Here’s the Wetland stamp set: Email me if you want to order it! Here’s the card I made. For the background, I used a really cool technique! I used the Clear Block “E” that I colored directly with the markers. (That’s right, color you whole block!) I used Soft Sky, Marina Mist, Crumb Cake and So Saffran Markers. Then you take a spray bottle (Stampin’ Spitzer bottle works just perfect!) and you mist the whole block with water. 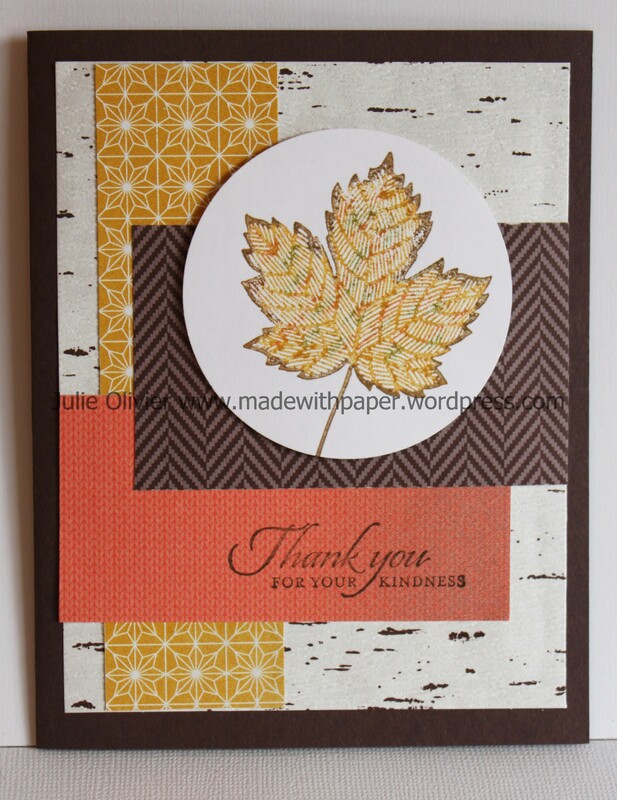 “Stamp” your card stock with the block and let dry before stamping the rest. 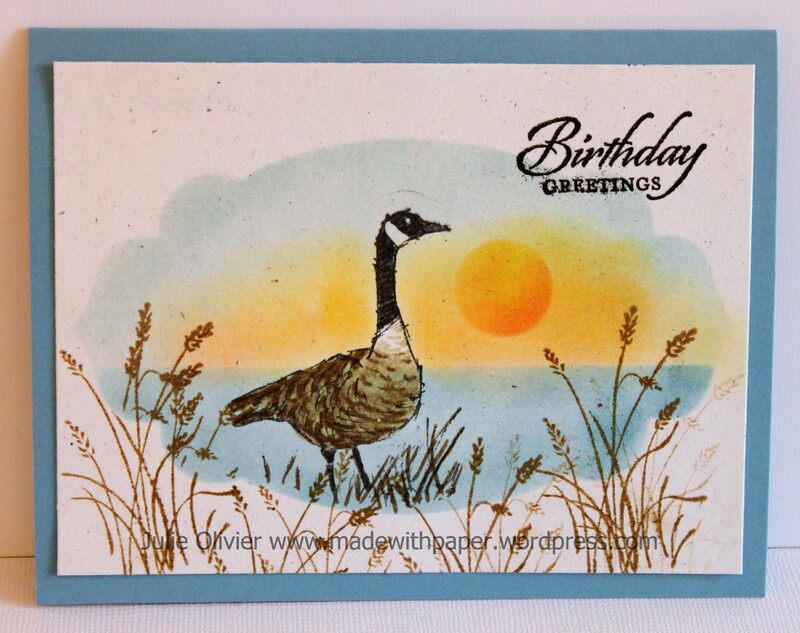 When the card stock was completely dried, I stamped the goose with StazOn black ink and colored it with the markers. Ink: Black StazOn,Stampin’ Markers: Soft Sky, Marina Mist, So Saffran, Crumb Cake, Sahara Sand, Basic Gray. Craft White ink.